I am taking a break for a while to read and reflect and as such I and am re-posting some articles from my Gettysburg text dealing with a man that I consider one of the most fascinating , salacious, scandalous, heroic, and incredible figures ever to grace and disgrace American history, Congressman, and Civil War General Daniel E. Sickles. The stage was now set for the one of the most unbelievable and storied trials in American history, a trial that would have been much more suited to the era of 24/7 cable news coverage and the Internet than the era of the telegraph and newspaper, but even so it was sensational by any standard and it riveted the attention of the public in every part of the nation, from the largest cities to the smallest towns. After Barton Key’s lifeless body was borne off in a mahogany casket to the Presbyterian cemetery in Baltimore and buried in the grave of his dead wife, and his children placed in the care of his family, his effects, what they amounted to, including his resplendent Montgomery Guards uniform were “sold off to a morbid, bargain-hunting, souvenir-hounding crowd.”  It was an ignoble end to the scandalous story of the son of Francis Scott Key, a story that soon with all of its salacious detail would be revealed to the public. Meanwhile, inside the jail her husband, alternating between fits of rage and calm was visited by Washington’s Mayor James Barret, Sam Butterworth, Attorney General Black, Vice President John C. Breckinridge, and Speaker of the House, James Orr. He was comforted by the many expressions of support and sympathy found in scores of letters from people around the country, one of the first “a kindly note from the President,”  and others from total strangers. He was also joined by friends and allies from New York and Washington. “James Topham Brady, John Graham, and Thomas Francis Meagher, able lawyers all, arrived post haste to defend their rash ally”  as well as his father who before offering encouragement to his son offered a sharp chastisement, “You hot-headed fool! That’s no way to settle things! No woman’s worth it! No matter how you come out of this, you’ve killed your career – White House and everything else.” Undeterred and calm Dan told his father that he understood and that if he had to he would do it again, after which, his father began to discuss the organization of his son’s defense with this legal team. 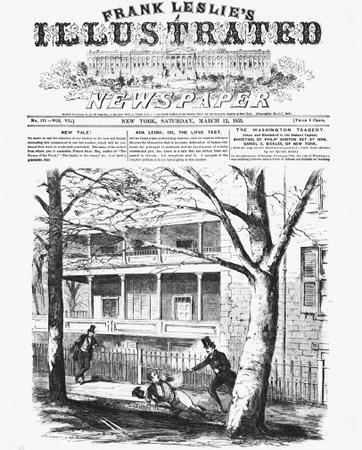 The case was front page news in all the major newspapers, which provided “extensive coverage of the “Sickles Tragedy.” Sickles’ murder of his friend Key in broad daylight in view of the White House had all of the scandalous elements that have thrilled Americans then and even today: “adultery, politics, celebrity, and a handsome corpse,”  not to mention a beautiful young woman who even more than her husband who had killed a man, stood accused in the eye of the public. Despite the notoriety of the case, many people found sympathy with Sickles and believed that no jury would convict him of murder or manslaughter, after all, Teresa was the one who committed adultery with Key. The New York Herald “doubted that a grand jury would indict him. Even if he were indicted, Harper’s Weekly presumed that no jury would convict him of manslaughter if the adultery charge were proven, which it considered a foregone conclusion.”  The New York Times noted well before the trial opened, “there appears to be no second opinion as to the certainty of Mr. Sickles acquittal” but “national interest” arose from “the general desire to see the whole case fairly put, and the million scandals of mystery laid to rest by the plain facts.”Newspapers like the New York Evening Post, his political arch-enemy found the murder an excellent opportunity to attack Sickles, “That wretched man, Daniel E. Sickles, has in his career reached the stage of assassination, and dipped his hands in human blood… It is certain that a man… who in his own practice, regards adultery as a joke and the matrimonial bond as no barrier against the utmost caprice of licentiousness – has little right to complain when the mischief which he carriers without scruple into other families enters his own.”  But such commentary was the exception, and it came from the organ of a political enemy. It is an interesting comment on the era, that a woman’s adultery, even when committed by the wife of an adulterous male who had killed her lover, was consider more of a social stigma and crime than murder. Within days Sickles had assembled one of the most formidable defense teams ever to dominate an American court. Brady, who was considered to be the ablest criminal defense lawyer of his day became the lead attorney for the defense team, and was joined by Sickles’ New York friends, Graham and Meagher. Brady was an excellent choice, he “was admired and even loved by society in general, but on top of that, though his legal repertoire was wide, he had been involved successfully in more than fifty murder cases.” And he “had also made a special study of pleas of insanity,”  something that would figure greatly in the trial. Sickles’ defense team was a nineteenth century legal Dream Team against which the government deployed but one attorney, Key’s former assistant District Attorney Robert Ould. Ould, described by one of Sickles’ biographers as “a dull bull of a man, at one time a Baptist parson,”  had been named acting District Attorney by President Buchanan when Key was killed. It was an odd place for Ould, as he was serving to prosecute his former boss’s killer, at the behest of the President, who happened to be one of the defendant’s best friends. Ould, the former parson “was placed by inference in the unhappy position of defending adultery – something that he indignantly denied, insisting that he was merely prosecuting a killer….”  but to many people, the murderer of an adulterer by an aggrieved husband was complete justified. Ould was totally outclassed by the defense team, and Key’s family paid to have John Carlisle a respected Washington attorney to aid Ould in the case, but the trial would prove them appear incompetent and not up to the task of convicting Sickles. The defense team made mincemeat of the prosecution. John Graham’s opening statement was a work of oratory genius that “would massively outshine Robert Ould’s more cumbersome opening.” Weaving allusions from Shakespeare and other literary greats into his statement, he painted Sickles as the victim of a adulterous rogue who had on a Sunday, a day when he should have “sent his aspirations heavenward,” had instead besieged “that castle where for security and repose the law had placed the wife and children of his neighbor.”  Casting Sickles as the aggrieved and temporarily insane victim he also asked if it was a “crime for a husband to defend his family altar.” From there he proceeded to use quotes from Shakespeare’s Othello he inveighs against the adulterer as the supreme criminal, piling up quotation upon quotation from the Old Testament and Roman law to show that in wiser days the punishment invariably was death’”  to paint the picture of Sickles’ agony as he saw the man who had defiled his wife prowling outside of his home. Graham then went to provocation and argued that due the circumstance of the crime, a friend and confidant attempting to defile Sickles’ wife on a Sunday that the prosecution “needed to prove Dan’s sanity at the time of the act. And they could not do that, because there was not enough in the case “to melt the heart that is not cut from the unwedgeable gnarled oak.”  It was a masterful performance. Over the next two weeks, Brady, Stanton, and Graham would continue to hammer the prosecution case. The defense proved that Key’s family had tampered with evidence, including testimony from a locksmith who had changed the locks at the 15th Street house at the direction of Key’s family. Witness after witness was introduced to undermine the prosecution and support the defense’s claim that Sickles’ was indeed in a state of uncontrollable madness, and the defense deftly parried the prosecutor’s rebuttal witnesses. When Ould attempted to keep African American witnesses from testifying Stanton, thundered and“accused the prosecution of a “monstrous” attempt to suppress evidence in its zeal of the defendant’s blood,”  and argued from North Carolina precedent that the prosecution was not willing to grant Sickles the same right as a slave. As his lawyers argued his case and witnesses gave testimony Sickles maintained his composure except for a number of times when he broke down and had to be excused from the proceedings. “Whether the courtroom histrionics were real or an award-winning performance, the jury witnessed firsthand a husband who was mentally unable to bear his wife with another man.”  On the Friday the 22nd of April Judge Crawford declared the testimony closed and the next day began the closing arguments. Saturday April 23rd dawned with a violent gale, but that did not prevent crowds of people from trying to gain admittance to the courtroom. Edwin Stanton began the defense closing arguments in a manner that was calm and precise. He brought up that justifiable homicide included that which was “committed in defense of family chastity, the sanctity of the marriage bed, the matron’s honor, the virgin’s purity.”  Since the prosecution had never brought into evidence Sickles’ own violation of these covenants his attacks on Key and the prosecution case hit home. As he continued his voice rose to a roar, sounding like a prophet of ancient Israel “Who seeing this thin, would not exclaim to the unhappy husband, “Hasten, hasten, to save the mother of your child! And may the Lord who watches over the home and family guide the bullets and direct the stroke!”  When Stanton finished the court erupted in a frenzy as spectators as well as supporters of Sickles applauded his closing. The closing had been masterful, emotional, and dramatic. In response Ould attempted to recover, but his arguments were weak, he agreed with the defense about the crime of adultery, and attempted to redirect the jury’s attention that it was Sickles who was on trial for murder and not Key for adultery, but he had already lost that argument. He called the defense of temporary insanity a ploy and “mentioned how easily, and readily a man on trial for his life might pretend to be deranged if he were on trial for his life.” But it was too little, too late. Since there was no psychiatric profession to weigh in on the matter, the argument of temporary insanity fell back on the “tradition of male marital dominance” and “that argument played well among men who rarely wore collars on their shirts…”  the very kind of men seated in the jury booth. 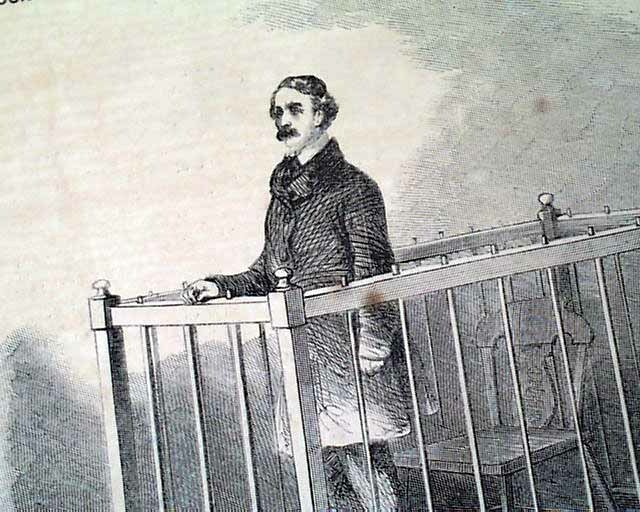 When the jury recessed to deliberate Sickles’ fate on the 26th it took them less than an hour to return their verdict, and few were surprised when it came back “not guilty.” Stanton “was so excited that he did a jig in the courtroom, the hoarsely called for three cheers.” As he did “Pandemonium and cheers broke out in the courtroom.” People crowded around to congratulate Sickles and the crush was so great that Sickles had to be escorted for the courtroom. President Buchanan on hearing the verdict was delighted, later in the evening, though he sought rest, Sickles was taken by Brady to a gala in his honor attended by nearly 1500 supporters and well-wishers. The trial was over but the trials of Dan Sickles were not. Despite the notoriety of the case, many people found sympathy with Sickles and believed that no jury would convict him of murder or manslaughter, after all, Teresa was the one who committed adultery with Key. The New York Herald “doubted that a grand jury would indict him. Even if he were indicted, Harper’s Weekly presumed that no jury would convict him of manslaughter if the adultery charge were proven, which it considered a foregone conclusion.”  The New York Times noted well before the trial opened, “there appears to be no second opinion as to the certainty of Mr. Sickles acquittal” but “national interest” arose from “the general desire to see the whole case fairly put, and the million scandals of mystery laid to rest by the plain facts.” Newspapers like the New York Evening Post, his political arch-enemy found the murder an excellent opportunity to attack Sickles, “That wretched man, Daniel E. Sickles, has in his career reached the stage of assassination, and dipped his hands in human blood… It is certain that a man… who in his own practice, regards adultery as a joke and the matrimonial bond as no barrier against the utmost caprice of licentiousness – has little right to complain when the mischief which he carriers without scruple into other families enters his own.”  But such commentary was the exception, and it came from the organ of a political enemy. It is an interesting comment on the era, that a woman’s adultery, even when committed by the wife of an adulterous male who had killed her lover, was consider more of a social stigma and crime than murder. The closing had been masterful, emotional, and dramatic. In response Ould attempted to recover, but his arguments were weak, he agreed with the defense about the crime of adultery, and attempted to redirect the jury’s attention that it was Sickles who was on trial for murder and not Key for adultery, but he had already lost that argument. He called the defense of temporary insanity a ploy and “mentioned how easily, and readily a man on trial for his life might pretend to be deranged if he were on trial for his life.” But it was too little, too late. Since there was no psychiatric profession to weigh in on the matter, the argument of temporary insanity fell back on the “tradition of male marital dominance” and “that argument played well among men who rarely wore collars on their shirts…”  the very kind of men seated in the jury booth. 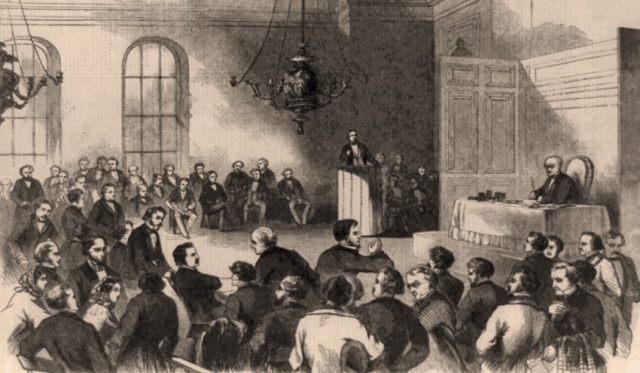 When the jury recessed to deliberate Sickles’ fate on the 26th it took them less than an hour to return their verdict, and few were surprised when it came back “not guilty.” Stanton “was so excited that he did a jig in the courtroom, the hoarsely called for three cheers.”  As he did “Pandemonium and cheers broke out in the courtroom.” People crowded around to congratulate Sickles and the crush was so great that Sickles had to be escorted for the courtroom. President Buchanan on hearing the verdict was delighted, later in the evening, though he sought rest, Sickles was taken by Brady to a gala in his honor attended by nearly 1500 supporters and well-wishers. The trial was over but the trials of Dan Sickles were not. This is the second of a multi-part series taken from my Gettysburg and Civil War text. It deals with one of the most memorable trials in American History. I hope that you enjoy. Meanwhile, inside the jail her husband, alternating between fits of rage and calm was visited by Washington’s Mayor James Barret, Sam Butterworth, Attorney General Black, Vice President John C. Breckinridge, and Speaker of the House, James Orr. He was comforted by the many expressions of support and sympathy found in scores of letters from people around the country, one of the first “a kindly note from the President,”  and others from total strangers. He was also joined by friends and allies from New York and Washington. “James Topham Brady, John Graham, and Thomas Francis Meagher, able lawyers all, arrived post haste to defend their rash ally”  as well as his father who before offering encouragement to his son offered a sharp chastisement, “You hot-headed fool! That’s no way to settle things! No woman’s worth it! No matter how you come out of this, you’ve killed your career – White House and everything else.”  Undeterred and calm Dan told his father that he understood and that if he had to he would do it again, after which, his father began to discuss the organization of his son’s defense with this legal team. Despite the notoriety of the case, many people found sympathy with Sickles and believed that no jury would convict him of murder or manslaughter, after all, Teresa was the one who committed adultery with Key. The New York Herald “doubted that a grand jury would indict him. Even if he were indicted, Harper’s Weekly presumed that no jury would convict him of manslaughter if the adultery charge were proven, which it considered a foregone conclusion.”  The New York Times noted well before the trial opened, “there appears to be no second opinion as to the certainty of Mr. Sickles acquittal” but “national interest” arose from “the general desire to see the whole case fairly put, and the million scandals of mystery laid to rest by the plain facts.”  Newspapers like the New York Evening Post, his political arch-enemy found the murder an excellent opportunity to attack Sickles, “That wretched man, Daniel E. Sickles, has in his career reached the stage of assassination, and dipped his hands in human blood… It is certain that a man… who in his own practice, regards adultery as a joke and the matrimonial bond as no barrier against the utmost caprice of licentiousness – has little right to complain when the mischief which he carriers without scruple into other families enters his own.”  But such commentary was the exception, and it came from the organ of a political enemy. It is an interesting comment on the era, that a woman’s adultery, even when committed by the wife of an adulterous male who had killed her lover, was consider more of a social stigma and crime than murder. Over the next two weeks, Brady, Stanton, and Graham would continue to hammer the prosecution case. The defense proved that Key’s family had tampered with evidence, including testimony from a locksmith who had changed the locks at the 15th Street house at the direction of Key’s family. Witness after witness was introduced to undermine the prosecution and support the defense’s claim that Sickles’ was indeed in a state of uncontrollable madness, and the defense deftly parried the prosecutor’s rebuttal witnesses. When Ould attempted to keep African American witnesses from testifying Stanton, thundered and “accused the prosecution of a “monstrous” attempt to suppress evidence in its zeal of the defendant’s blood,”  and argued from North Carolina precedent that the prosecution was not willing to grant Sickles the same right as a slave. As his lawyers argued his case and witnesses gave testimony Sickles maintained his composure except for a number of times when he broke down and had to be excused from the proceedings. 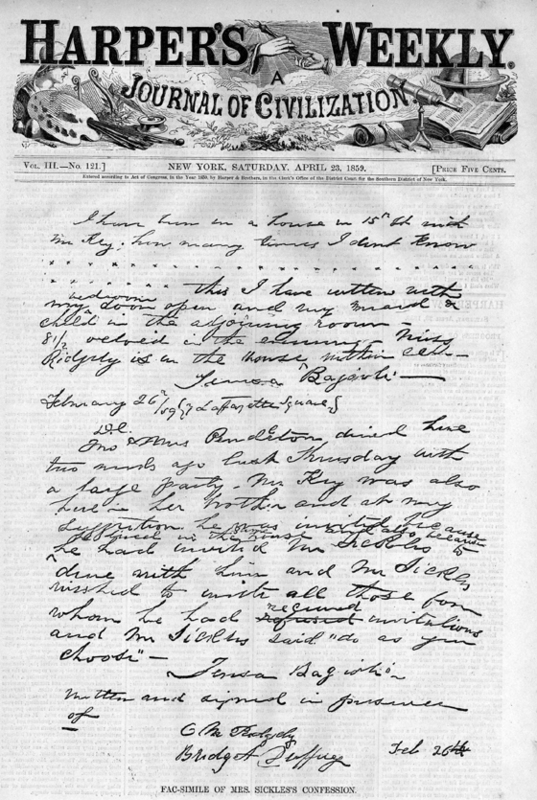 “Whether the courtroom histrionics were real or an award-winning performance, the jury witnessed firsthand a husband who was mentally unable to bear his wife with another man.”  On the Friday the 22nd of April Judge Crawford declared the testimony closed and the next day began the closing arguments. The closing had been masterful, emotional, and dramatic. In response Ould attempted to recover, but his arguments were weak, he agreed with the defense about the crime of adultery, and attempted to redirect the jury’s attention that it was Sickles who was on trial for murder and not Key for adultery, but he had already lost that argument. He called the defense of temporary insanity a ploy and “mentioned how easily, and readily a man on trial for his life might pretend to be deranged if he were on trial for his life.” But it was too little, too late. Since there was no psychiatric profession to weigh in on the matter, the argument of temporary insanity fell back on the “tradition of male marital dominance” and “that argument played well among men who rarely wore collars on their shirts…”  the very kind of men seated in the jury booth. When the jury recessed to deliberate Sickles’ fate on the 26th it took them less than an hour to return their verdict, and few were surprised when it came back “not guilty.” Stanton “was so excited that he did a jig in the courtroom, the hoarsely called for three cheers.”  As he did “Pandemonium and cheers broke out in the courtroom.”  People crowded around to congratulate Sickles and the crush was so great that Sickles had to be escorted for the courtroom. President Buchanan on hearing the verdict was delighted, later in the evening, though he sought rest, Sickles was taken by Brady to a gala in his honor attended by nearly 1500 supporters and well-wishers. The trial was over but the trials of Dan Sickles were not.